So, onto the second day of this part of our trip. 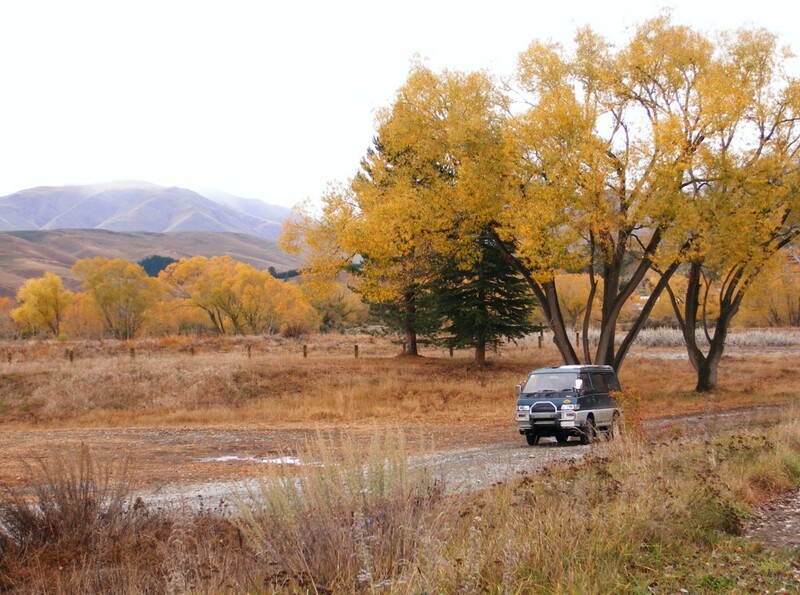 We stayed the night in a very small township called Twizel. This really is a very remote little settlement, several hours from anywhere of significant size, and it’s very cold in winter and very hot in summer. Not much of New Zealand experiences ‘continental’ weather patterns, but this is one of the places that does. 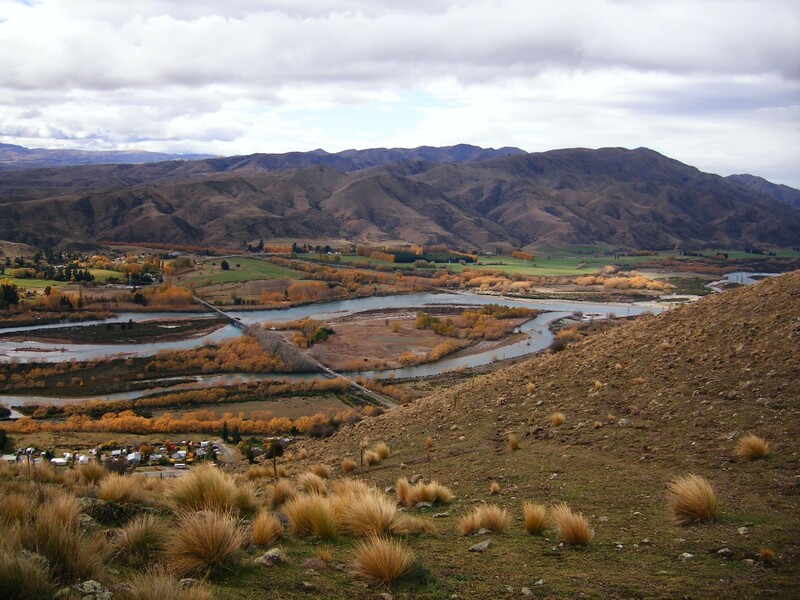 Twizel owes its existence to the fact that much of the South Island’s electricity is generated from hydro power – that is, nasty big dams put across most of our rivers of any significant size. It was intended to be a temporary town, and it still has something of that air about it, but has now become a bit of a tourist area. Our first cache of the day was actually a backtrack to Iced Over which I mentioned in yesterday’s blog. 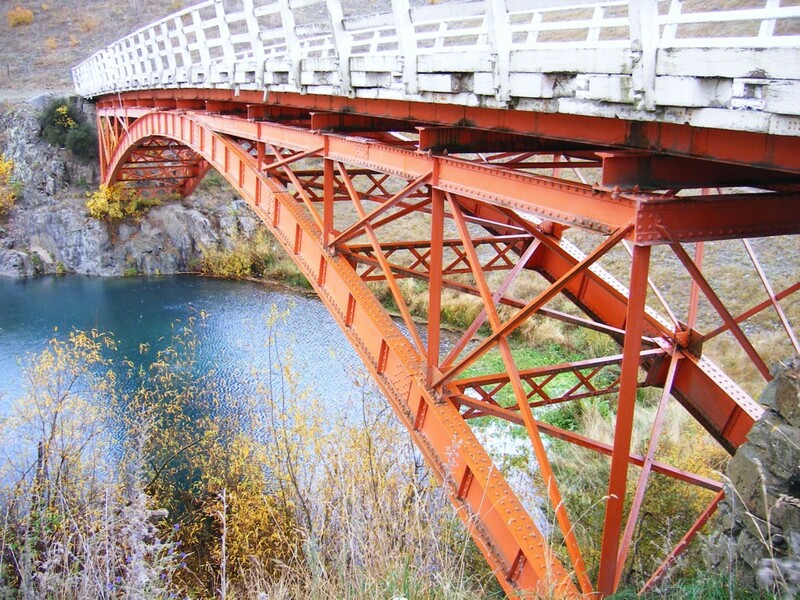 The first new autumn highlight of today is GCPBZQ Old Iron Bridge . This required a wee scrabble down the bank, but nothing too serious, and the scramble also provided for a unique photo opportunity with a different angle on the bridge. 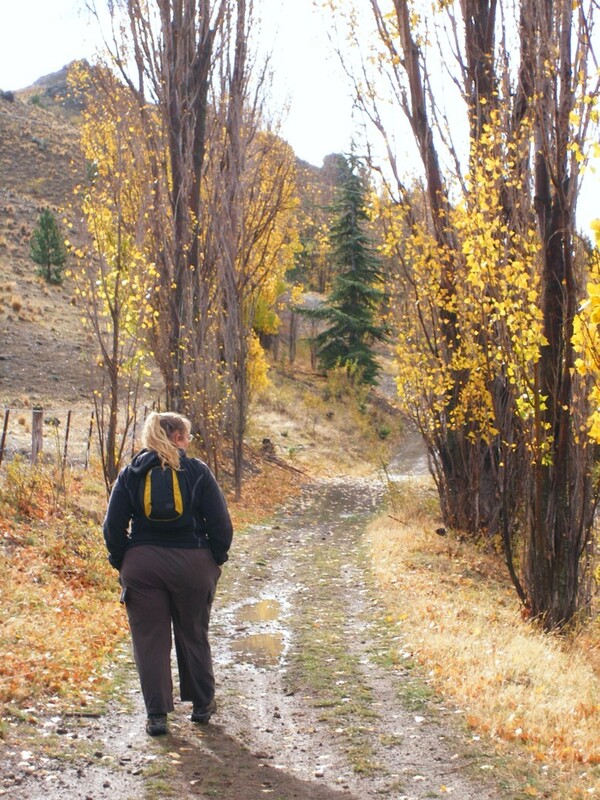 There are a number of other caches in Twizel, and the surrounding area, as well as on the journey south. A good one, if you want a….. ummmm….. close-up encounter of a proctological nature with a giant black stilt statue, is GC1GZ1Z Black Stilt Market !!!! These next two photos are both in the area of GC19JD2 Aviemore Picnic Area. It is indeed near a picnic area, but it’s no picnic getting to the cache itself. A short but rather steep drag up a hill that will have you puffing (unless you’re a hillwalker of course)! We could, in theory, have taken the cachemobile up the track, but seeing as it will fall over on its side a little more easily than your average 4wd vehicle, we opted for 2leg drive instead. 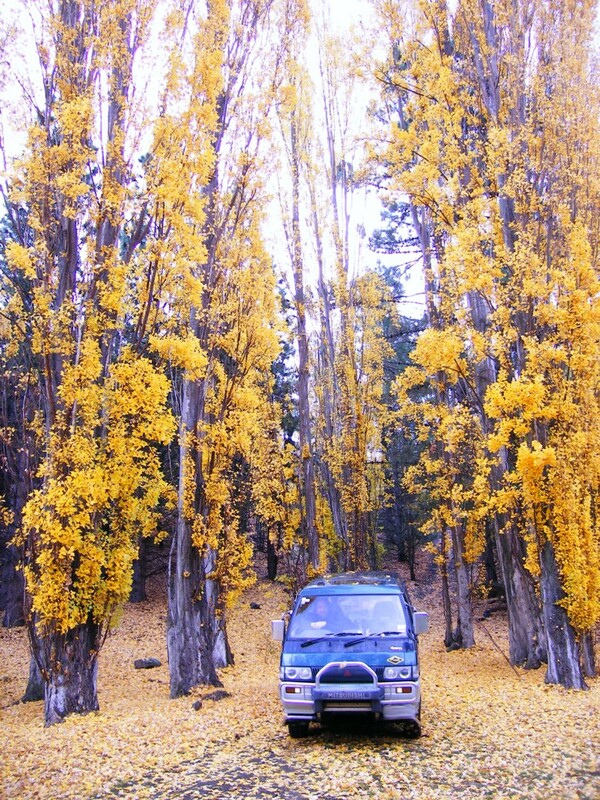 I have to confess we had as much fun here playing in the leaves and taking photos as we did finding the cache. And while we’re talking of hill walking, Avimore is a good Scottish name isn’t it, and together with the next cache you’d wonder if we were suffering a little from spacial displacement, as the caches we visit next are near the Benmore dam. There are two caches that we did near here. They were: GCH5HA Hill Top View And GC19JD0 Benmore Dam Lookout which would be an awesome place to be standing (if it’s allowed) when the slipway had water thundering down it. You would be well damped by the spray shall we say!! It is basically a drive by, or walk by, depending how you approach – we walked across the top of the dam, but Hilltop View is, obviously, up a hill. Bitsprayer must walk faster than us, as from memory I’m darn sure it took more than 5 minutes. There are one or two more cache along this track, but for some reason we didn’t do them. I think time was catching up on us. 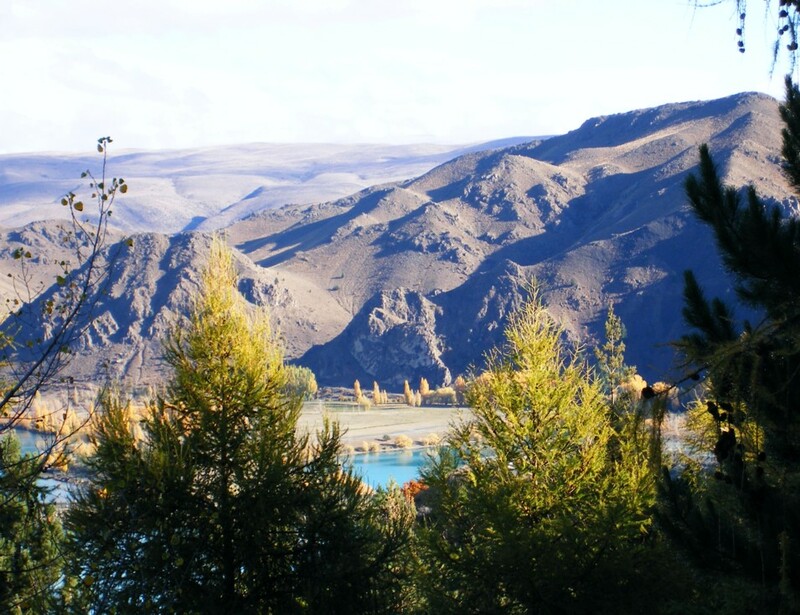 We did a few more caches as we carried on down State Highway 83 though the Waitaki Valley , travelling beside the Waitaki River to the really tiny settlement of Kurow which was our destination for the night. Kurow had its downsides. It was here that something strange in the air made both our brains and our GPS go haywire. Our GPS in that it misplaced a whole great swathe of its mapping – a big section right across the country from east to west, including Kurow. So we had the novelty of caching with just the arrow to guide us. And our brains in that we somehow managed to leave our gas cooker at the camping ground, and to decide that we would walk up a big hill. This photo, though, is from a cache that we did before walking up the big hill. You can almost see it (well, not really!) in the summit photo below. See that ‘island’ in the middle of the river?? The photo is taken there, just opposite the cache GC188BE Waitaki Island . It was a rather difficult find as GZ was tricky to pin down and the area a bit rubbishy, but more scenic views almost made up for it. Near the summit of the big hill some foolish person had placed a cache. GC11BHP Kurow View so of course we had to walk up there and get it. It’s a relatively small hill by world standards I expect around ( ~ 450 metres, or just under half a Munro, to where we went), but in a state of unfitness it was quite a big enough hill for me. From a caching POV it was one of those where you spend 2/3rds of the time walking in the opposite direction to the arrow, watching the ‘distance to cache’ increasing instead of decreasing as the zigs lead you away from the cache while the zags temporarily lead you back in the right direction again. Luckily the track was in pretty good shape (unlike me), the views were good, the vegetation interesting and a husband who took hold of the GPS and refused to tell me what it said, motivated me to the top! The journey up was quite pleasant actually but the last bit was chilly chilly chilly. Very very chilly for the last 100m or so today – I’m sure the wind was blowing right off the snow on the futher away peaks. Thanks to our sponsors Macpac, Columbia, Fairydown and other assorted companies we added a few extra layers of clothing and located the cache while remaining reasonably toasty warm! We also found the best lemon muffin in New Zealand at the one and only café in Kurow, before continuing on our way to historic Oamaru home of both the Little Blue Penguin and NZ’s most prolific cache placer! !